ATV Prices. 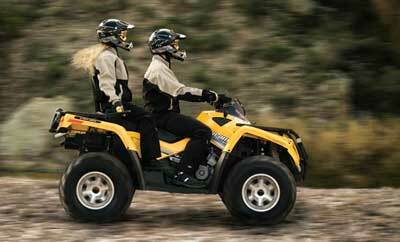 See the Latest ATV, UTV, Quad and Four Wheeler Prices. Your Ultimate Guide to ATV Values. Our Guide to ATV Prices is intended to keep you between the ditches (price wise) when you buy your next ATV. How else will you know if you're getting a decent deal on that shiny new 4 wheeler? We've included several sections of info to make it easier to find what you're looking for. You can also find some tips and tricks in each one, so be sure to check them all out. NADA ATV Value Guide - Step by step instructions plus a video tutorial on how to get the most accurate and current ATV prices. Arctic Cat ATV Prices - Use our quick reference guide to see the latest prices on all Arctic Cat ATV and UTV models. Easy to use list of all the prices in one place. The Latest New and Used ATV Values - We show you how to find the absolute latest, most up to date four wheeler prices. The first step in getting the best deal possible on your next ride. New sections have been added for UTV values with the rapid growth and increased interest in this segment of the ATV world. Price Guide for Used ATVs - Learn the ins and outs of using the two most popular price guides for used ATVs. These are the same guides the ATV dealers use, why shouldn't you? Included are some little known tips and tricks to help you figure the true value of that quad. How to Find the Best Free Sources of Used ATV Prices - There really aren't any "official" four wheeler price guides. But there are a couple of good ones if you know where to look. That's what we're going to help you with. Used Four Wheelers for Sale - Now that you know all about four wheeler prices - why not go shopping for some great deals? You'll find out about the best places to look and why. And what to be aware of from some popular sources. Prices for New Arctic Cat ATVs - A quick reference guide to prices for new Arctic Cat ATVs. Links to the best places to find used Arctic Cat prices are also included. If you're thinking about buying a new Arctic Cat, or would just like to know the current price of a certain model, this is the place to start. More Tips On ATV Prices. Time of year - Many dealers offer discounts later in the year so they can move old stock out to make room for new models. Likewise, demand can be stronger before a hunting season in some areas, so prices may be higher during those periods. Models that are being discontinued - Dealers don't like to keep discontinued models on their showrooms and are more likely to offer better deals on them. High demand for a new model - A popular new model is probably going to cost more because the dealer has no incentive to mark the price down. If you won't pay it, the next guy will. Local economy - Prices will usually rise and fall with the condition of the local economy. If you don't mind traveling to find a better deal, this can be a great way to save a few bucks. Did a big factory close in a nearby town? If so, ATV prices will likely be falling there. Models that haven't changed for a while - This is our favorite kind of deal. You can find brand new models just like the current one, only a few model years behind, for huge price breaks! Same model, still brand new, same warranty, for thousands less. What's not to like about that? Strong demand for a used model - Popular brands and models influence the true value of ATVs also. Honda ATVs have a reputation for solid reliability, so dealers know that buyers will generally pay more for the Honda brand. That same principle can also work in reverse for models with a reputation for trouble. When it comes to ATV prices, a price guide will give you a good idea of the value of a four wheeler, but it's not the final word. So our advice is to use that value as a starting point, but do your own research of the market in your area to get a better idea of the real selling price of that ATV.